Being one of the main financial institutions in the country with high social responsibility, Moldindconbank becomes the first Bank to help buyers acquire their own home through the First Home program, shrinking twice or by -1.5% the margin profit, admissible under the program. By this decision, the bank aims to reduce the total cost of credit from June 23, 2018 and to facilitate access to the program for more citizens of the country. Thus, purchasing your own home through Moldindconbank branches becomes the simplest and most advantageous. At the same time, as a result of the forecasts regarding the refinancing rate, we can assume that in the near future the purchase of the house with the help of the First House credit will become even more accessible. 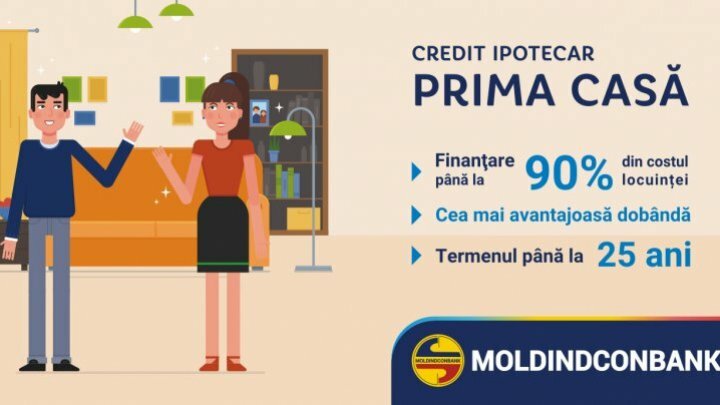 Currently, Moldindconbank is one of the most active partners of First House program and one of the largest lenders of the economy and the population of the Republic of Moldova holding a loan portfolio of about 6.4 billion. lei (20% market share). For details on the First House program visit www.micb.md or visit Moldindconbank.